Vancouver River District Neighbourhood Launching! 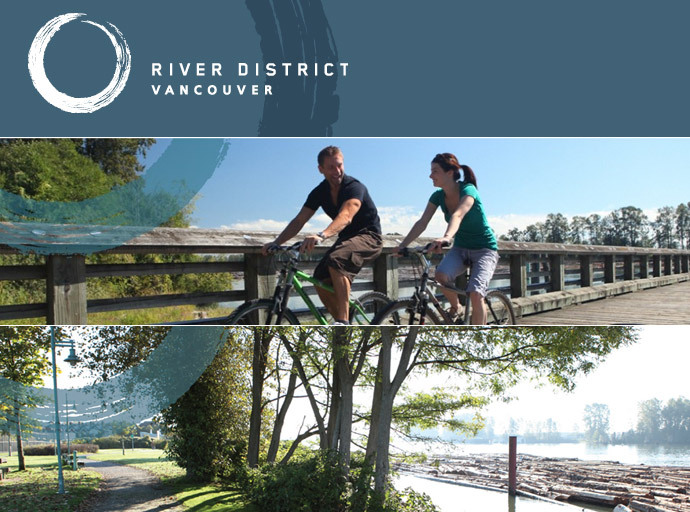 According to the latest press releases from April 2011, the former East Fraserlands Vancouver real estate property, now renamed the River District Vancouver community will be commencing development along the 130 acre prime property in southeast of the Fraser River. The first project will be by ParkLane Homes and represents a portion of the largest waterfront property that has not yet been developed. The Vancouver River District community will be home to a mix and great variety of housing types that will include a master planned collection of townhomes, low and mid rise condominiums as well as high-rise condo towers. In addition, the River District Vancouver real estate community will be home to 2 new schools, a great community centre, recreational facilities retail stores, grocers, shopping and dining. The exciting new neighbourhood will also include a waterfront pier, park green space as well as a community centre. The announcement comes from ParkLane Homes which will be in collaboration with Polygon Homes to develop the first phase of the Vancouver River District to create a truly sustainable East Fraserlands condo community. Construction on New Water at River District Vancouver real estate development is upcoming and the pre-sales launch is scheduled for Spring 2011! The River District Vancouver New Water condos will be an amazing collection of waterfront homes by two notable and well experienced builders in ParkLane Homes and Polygon Homes. The district will be forever transformed through the revitalization of the area. For more information please refer to this website www.riverdistrict.ca. River District Vancouver Real Estate Community Launch! ParkLane Home’s long anticipated waterfront Vancouver community is about to launch this Spring 2011! Formerly known as the East Fraserlands Vancouver real estate district, this 130 acre site is located just adjacent to the Fraser River in southeast Vancouver. Based on New Urbanism design principles, the River District Vancouver real estate project features a well planned mix of townhouses, low and midrise apartments, and highrise towers that will soon launch in succession. Future phases of the Vancouver River District ParkLane Homes project will include shopping, a grocery store and small format retail as well as a community plaza, community centre, two new schools, park space and the beautiful waterfront pier. Get in on this ground level opportunity at Phase 1 of River District at the Vancouver New Water project that is coming May 2011 and will be built between the collaboration of ParkLane Homes and Polygon Homes. Soon launching, the New Water Vancouver apartments will be located in the prime East Fraserlands neighbourhood along the mighty Fraser River in the South Vancouver real estate market. This waterfront Vancouver condo development by Polygon Homes will give rise to a beautiful new urban neighbourhood with welcoming amenities, services, people and outlook. The East Fraserlands Vancouver New Water condos by Polygon will feature the first project in this community redevelopment which is master planned to add new schools, urban green spaces, recreational parks, dining options, shopping and much more. As one of the most sought after and latest new communities under redevelopment, the East Fraserlands New Water Vancouver condos for sale will redefine waterfront living in the South end of the city. Featuring only a limited number of waterfront Vancouver condos for sale, the East Fraserlands New Water by Polygon condos will boast West Coast living with modern architecture, quality construction with steel, concrete and brick facades as well as warm detailing that includes natural fir wood detailing. The affordability is a key driver to the anticipation of the project launch, as is the beautiful and untouched locale. The range of floor plans at the New Water Vancouver condos in East Fraserlands real estate development will feature 1, 2 as well as 3 bedroom homes. Inside, the waterfront Vancouver condos will have stainless steel Bosch appliance sets for the kitchen, in suite laundry, parking and quartz countertops. Also, the floor plans at the East Fraserlands Vancouver New Water condos will feature spacious outdoor living spaces that are private and great for entertaining. The current plan is for pre-sales to start in the Fall of 2011. Please register your interest for the New Water Vancouver condos for sale today to get the latest VIP release of information. Remember that this is your chance to get into the ground level opportunity at the waterfront East Fraserlands district and the project is built by well established and experienced Polygon Homes. MAY LAUNCH – Polygon Homes Building Luxury New Water River District Vancouver Riverside Apartments! From the latest marketing release: New Water by Polygon is a new premier riverfront Vancouver apartment community along the newest and most exciting new neighbourhood at River District. The River District Vancouver real estate district consists of over 130 acres of land, and will be developed by ParkLane Homes in collaboration with select award winning builders such as Polygon Homes. 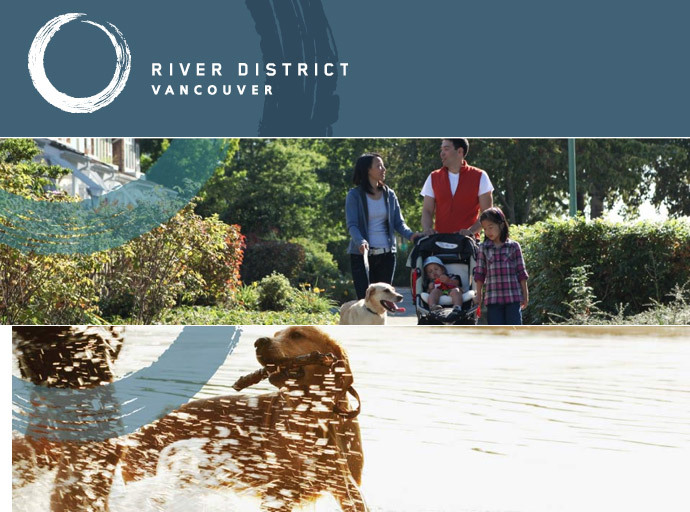 The new River District Vancouver real estate community is in the southeast portion of the city along the mighty and beautiful Fraser River area. Convenience is the key to the anticipation of these riverfront Vancouver New Water condos for sale as they are going to be less than 10 minutes away from Metrotown Burnaby, even shorter distance from Richmond and YVR in addition to being just twenty minutes away from the downtown city core. Formerly called the East Fraserlands District, the new name is now River District Vancouver, and Polygon homes will be building out the first set of luxury waterfront New Water Vancouver condos for sale this year! The master planned River District Vancouver real estate development plan will incorporate the best of the principles from New Urbanism, giving homebuyers a wide selection of cityhomes, townhomes and a combination of low rise to high-rise condo tower residences. The first release at River District are the New Water Vancouver condo community which will feature a striking architectural façade and low-rise boutique waterfront living spaces. Part of the master plan of the community include the addition of two new schools which will be highly rated, a community recreation centre, grocery, retail, shops, a central community plaza, park space as well as a beautiful waterfront pier for all to enjoy. In collaboration with ParkLane Homes, Polygon’s New Water Vancouver waterfront condos will be a limited collection of luxury homes with contemporary West Coast architecture with a great and unique façade of steel, concrete and brick in combination with natural fir/wood detailing. The New Water Vancouver River District condos will feature both 1 and 2 bedroom apartment floor plans that will be all open concept and will have over height ceilings and large windows to allow for lots of natural light and incredible views from your living rooms. The contemporary and high-end finishes at the luxury New Water Vancouver River District condos includes radiant in floor heating, which is great during those colder winter mornings, Bosch appliance package and stone quartz countertops. The pre-sales for the Vancouver New Water condos will be starting May 2011 and for more information about the River District community, please visit the ParkLane’s Experience Centre which is now open at Kerr Street along the Fraser River south of Marine Drive. New Water by Polygon, a premier collection of Vancouver waterfront apartment homes created within the smart, newly planned community of River District Vancouver real estate market. Located along the beautiful banks of the Fraser River, minutes from Metrotown, Richmond and downtown Vancouver, the New Water Vancouver waterfront apartments for sale will purposefully transform into an amenity rich town centre to celebrate, shop and gather with friends on its sun drenched parks and shore. To register for VIP info on the new waterfront apartments at New Water River District by Polygon, please call 604.871.4125 or visit www.polyhomes.com.